Mar. 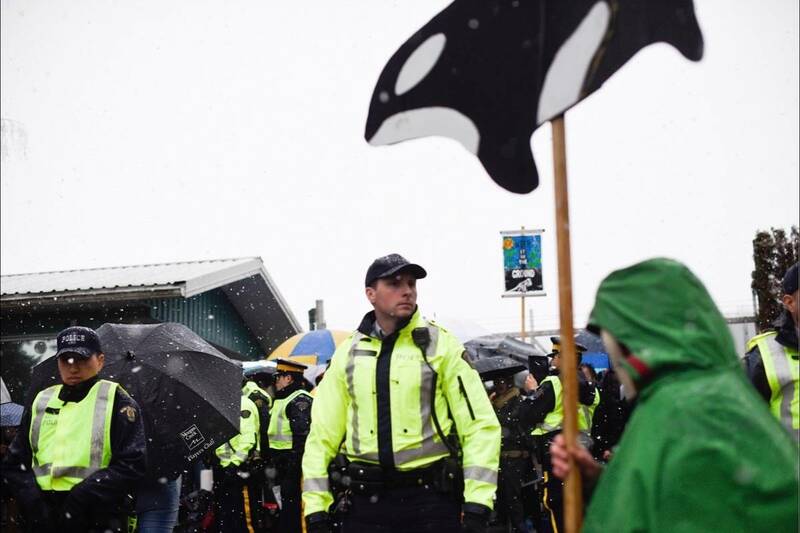 26, 2018 2:30 p.m.
A 41-year-old man is facing possible charges after he allegedly removed a City of Burnaby survey monument, and demonstrators at the nearby Kinder Morgan protest site rushed over to help as he was being arrested. Police said Monday it happened at around 6 p.m.the night before in the 8000-block of Shellmont Street. When an RCMP officer arrived to arrest the man, he allegedly resisted, and the protesters ran over to stop the officer from catching him. The man was eventually chased down and taken into custody, but not before the Mountie was allegedly injured by a protester. Charges are being considered for several other protestors, police said. More than 100 people so far, including Green Party of Canada Leader Elizabeth May and local MP Kennedy Stewart, have been arrested at anti-Trans Mountain pipeline expansion work site in the past few weeks.